Cassidy needs a change of scenery. She's brokenhearted and doesn't want to be anywhere near her ex boyfriend. That's why she decides to stay with her father for the entire summer. She leaves her mother and grandmother behind so she can experience something new. Her father runs a bed & breakfast together with Cassidy's stepmother. Cassidy also has a little brother who adores her. She's never felt like a real part of their family, but this summer that can change. Cassidy's father made sure she has a job, so she has something to distract her. Hopefully being among happy people who enjoy the beach and the sunshine will make her feel whole again. Bryan's life changed because of an accident. He's wheelchair-bound now and needs to find a new way of living. He loves a challenge and used to be into adventurous sports, but being in a wheelchair limits his options. He has his job as a summer camp counselor back though, so he can do what he loves the most, working with children. Cassidy works at the camp as well and Bryan thinks she's both pretty and friendly. They immediately become good friends and he shows her around, so she can meet new people and find out more about his favorite places to hang out. Is there a chance they can become more than that or is it just some summer fun? The Season of You & Me is a sweet romantic story. I loved that Bryan is strong, capable and independent. That made him absolutely wonderful. Being in a wheelchair isn't easy, but he fights for what's important to him and it was great to read about. Of course he has his moments of grief, but he tries to make the best of things. I loved Robin Constantine's descriptions of his situation, they're both compassionate and realistic. Cassidy is a sad girl at the beginning of the book, but Jersey Shore's beautiful surroundings and kind people are changing that. She feels welcome in her father's home and she has friends who are looking out for her. She knows her ex boyfriend isn't good news, but her heart doesn't want to listen and she needs time and distance to get over him. Fortunately Bryan understands her and he never pressures her which makes him extra wonderful boyfriend material. I think Robin Constantine has given both of her main characters multiple layers of depth and a great personality. 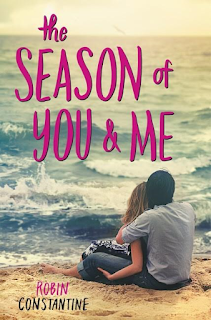 The Season of You & Me is an easy read, which takes the heaviness out of the darker side of the story. I liked that combination. The setting is brilliant and I loved Robin Constantine's vivid descriptions of the island. It was fun to read about the locals and their regular places to hang out. Something else that I really enjoyed was that Robin Constantine writes about kids in such a fantastic way, Cassidy's brother is adorable. 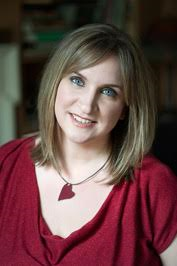 Last, but not least she also knows how to write about food that makes your mouth water. Together this makes the story complete and whole. I loved all those different sides of this novel and think the Season of You & Me is a great summer read. One very lucky reader will receive a copy of The Season of You & Me. Can't wait to read. Thanks for the opportunity. 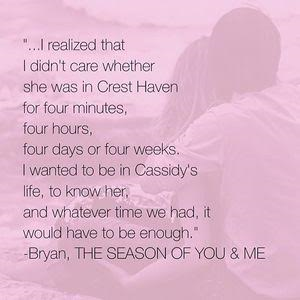 Have not read The Season of You and Me yet, but it sounds awesome! Thanks for the giveaway! I'm excited for this book. I Have not read the previous books. THE SEASON OF YOU & ME giveaway is amazing. I haven't read this book but it looks great! Would love to read it and have the opportunity to review! Great giveaway! I have noticed this book a while ago and would love to read it! I love the cover and title! I have not read any of the other books. The Season of You and Me sounds great. I'd love to read it. THE SEASON OF YOU AND ME by Robin Constantine. but i enjoy reading and discovering new authors. I haven't read any by this author. The cover is what drew me in. I love the beach and summer romance.